Prison guards prepare a strict operative to transfer two of the four Mapuche prisoners on hunger strike (now on its 52nd day) from Concepcion Hospital. The transfer would be for Erik Montoya (20 years old) and his cousin Rodrigo Montoya Melinao (19 years old) who have each lost 12 and 15 Kg respectively. They will be taken to the Court of Appeals of Collipulli in order to continue the Oral hearing that accuses them of “attempted homicide against police” and the “illegal possession of a weapon.” The hearing will be held tomorrow Thursday at 12 noon. The transfer will be carried out by guards, prepared with absolute secrecy according to Radio Biobio, after the Chief of Justice was notified of the trial that was supposed to be held last week, just one day after the four strikers arrived in Concepción. Only an abrupt change in the state of health of the Mapuche would modify the plans, but according to the latest evaluation by government representatives, the hunger strikers remain stable despite rejecting venipuncture therapy and health exams. The family of the hunger strikers, the Wente Winkul Mapu Community, the Support Network to the Communities in Struggle, Mapuche student centres and social organizations CALL OUT to join the camp in front of the Regional Hospital to beware of this transfer. In between the concern and confusion of family, even of the press, Gendarmerie transferred two of the four Mapuche youth marking the 53rd day on hunger strike. Dozens of people marshalled all night around the Regional Hospital of Concepcion awaiting the transfer of Rodrigo and Erik Montoya to the hearing in preparation of the Appeals Court trial in Collipulli. However, after 9AM two of Mapuche Political Prisoners were taken out of the grounds by personnel of the Gendarmerie Special Forces Unit (USEP) in complete silence, without informing their family or community leaders in their now critical state of health. On the other hand, there has been information that three of the hunger strikers were released from hospital, where only Erik Montoya should remain hospitalized until a new medical report can be evaluated by the Court of Collipulli to permit his return to Angol. It was in this way that Paulino Levipan and Daniel Levinao were also taken from the Hospital to the El Manzano Prison of Concepcion, transferred under the radar, without the proper measures for their state of health and moreover without any reasonable explanation for they remain in Concepcion. This therefore shows the will of the Judicial and Executive powers in their continued harassment to the hunger strikers in order to stop their dignified action. The five Mapuche Political Prisoners in Temuco announced that beginning Friday mourning; they will stop consuming water, which will worsen their conditions of health in a matter of hours. Meanwhile, the Gendarmerie presented an injunction to force feed the prisoners. 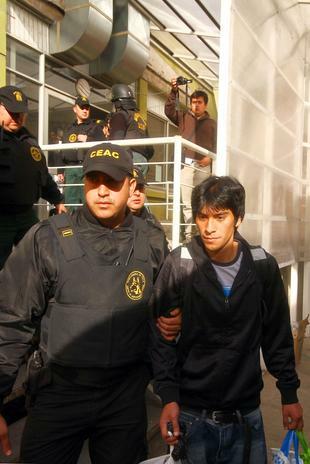 The legal action seeks to force feed the hunger strikers and the transfer to an assistance centre, which will be presented in the next few days in the Court of Appeal of Temuco, according to the director of Regional Gendarmerie of Arauco, Carlos Cortes, stated to the newswire SoyTemuco. We should note that this is a serious injunction presented by the Gendarmerie, after the Justice system would carry out a similar measure regarding the four Mapuche Political Prisoners held at ConcepcionHospital. Luis Marileo, Leonardo Quijon, Fernando Millacheo, Guido Bahamondes and Cristian Levinao ask to be transferred to Angol Prison as their fundamental demand, where the rest of the Mapuche Political Prisoners are held and are closer to their communities. The Mapuche will initiate their dry hunger strike beginning 12AM Friday mourning, if the transfer is not carried out and there is attempt to be force fed, which would mean not consuming any nutrition or water, which would seriously worsen their state of health in a matter of hours.